2. Over discharge voltage prevention. 5. Protection from high temperature of the battery. 6. Protection from the increase in internal pressure of the battery. Why do Li-ion batteries need protections? The negative electrode of Li-ion batteries consists of, mainly, carbon or graphite that can store or release Li ions. Once there's an over discharge voltage, the Li ions turn to be Li metals and deposit on the carbon or graphite surfaces. Because the Li metal is very active, it can burn by any flush or other reasons. The electrolyte contains flammable organic solvent. Therefore, once the used charger goes wrong and there is an existing overcharge voltage, the voltage wingo above 4.7V, and the Li-ion batteries will be overheated and then to be burned. In order to prevent deep discharge that leads to shorten the cycle life of the battery, the Li-ion batteries need an over discharge protection. 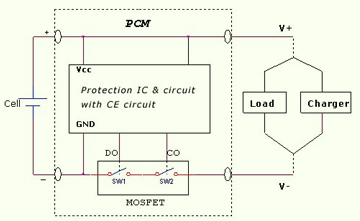 The Protection Circuit Module (PCM) is used to protect lithium-ion(Li-ion) rechargeable battery from over-charging, over-discharging and overcurrent. The PCM is suitable for protecting a single-cell pack. The PCM can detect over-charging, over-discharging and excess load current of Li-ion battery, further include a short circuit protector to prevent large external short circuit current.